Note: this post does not mean I wholeheartedly condone Modern Warfare 2's linear narrative structure because I choose to work inside its confines. It's simply an interesting exercise to write within a predetermined framework, something game writers unfortunately have to do entirely too much. I recently reread Tom Francis' brilliant reimagining of BioShock's ending, and it got me thinking about my previous post which detailed my views on Modern Warfare 2's "No Russian" level. My main complaint was how the linear narrative of Modern Warfare 2 isn't suited for such a set piece, yet it was limited to just that: a complaint. Everybody can point out problems, but only a few go that extra mile and come up with a solution. So I aim to provide an answer to the narrative problem presented by the "No Russian" level. This might go against the very spirit of a Call of Duty game, which has built its entire union of story and gameplay around linear progression. But at least Infinity Ward are not kidding themselves. They have finetuned that union to the point where they can experiment with it and push it to new limits, with the "No Russian" level as a result. Granted, I wouldn't be surprised if another part of Infinity Ward's reasoning was to stir up some controversy and free publicity. But I'm pretty sure they figured they had built up some credit with Call of Duty 4: Modern Warfare (and in particular, its nuke and AC-130 gunner sequences). The main question that caters to both the story and gameplay point of view is: "How do you offer the player an element of choice in the "No Russian" level without sacrificing any subsequent missions?". What we require is a setup that accomodates a player's choice to stop the attack from happening but doesn't break the flow of the story. No easy task, considering that writing within a preset setting (a presetting?) presents unique challenges to overcome and compels a writer to invest more creativity. Tom Francis redesigned the entire second half of BioShock to fit his ending, but we don't have that luxury (which by no means detracts from the level of genius he poured into it). I realize that at any rate we'd still be cheating the player because the choice he makes can ultimately have no effect in the grand scale of things. But in this case, it's better to feel slightly less cheated. Let's first look at the narrative traits that set up the "No Russian" level, so we can accurately determine the confines we have to work in. If you are unfamiliar with "No Russian", read my previous post. The fact that the game ends if you choose to stop the attack means that your character, Joseph Allen, has made the decision not to interfere, and you're playing out his decision. That's an element we have to remove. The choice can then be broken down into two optional paths: allowing the attack to take place, regardless of participating in it (which is the way "No Russian" plays out in its current state) or stopping the attack by killing all of your comrades at any point during the level without dying (which is the option we now have to fit into the whole story). In that respect, I made a mistake in my previous post in pointing out that the missions set in Washington D.C. depend on Makarov's attack being carried out. Modern Warfare 2's intro tells the player that the Ultranationalists have seized control of Russia, and the mission set in Kazakhstan to retrieve an ACS module provides clues that they are preparing logistics for an invasion, regardless of any provocation. This means the Washington D.C. missions are not wholly dependent on Makarov's attack and need only the slightest of motivations, because the Ultranationalists clearly want to invade the United States. Maybe even the intent of Makarov's attack is enough. No matter how the level plays out, there will always be a presence of heavy weapons alongside an American in a Russian public airport. And since the link between Makarov's attack and the invasion is only explicitly stated once ("They're killing a thousand Americans for every dead civilian in Moscow. "), the briefings introducing the Washington D.C. missions would require only slight rewording. 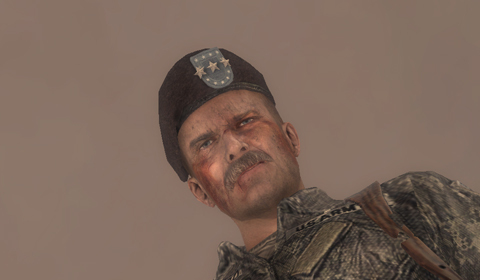 It's in fact the missions set in Brazil and revolving around Captain Price that are in danger if the player chooses to stop the attack, because that choice involves Makarov being killed, which has far-reaching repercussions for the remainder of the story. There would be no need to track down Alejandro Rojas in Rio De Janeiro (a very simple mission objective which sets up a substantial portion of the game's content) and no need to extract Makarov's adversary from a Russian gulag (thus eliminating the setup which brings back Price). So how do we keep those elements while still accounting for Makarov's death? His physical presence is sorely underused after "No Russian", so his absence in the game itself should be no large hurdle to overcome. A simple solution would be to have Makarov direct the attack from an armchair rather than having him be physically present in it, therefore precluding the player from being able to kill him while still affording the option to stop the attack. But this feels like a cop-out and diminishes Makarov even more as an adversary. So we go deeper. For convenience's sake, let's say the mission starts exactly the same. 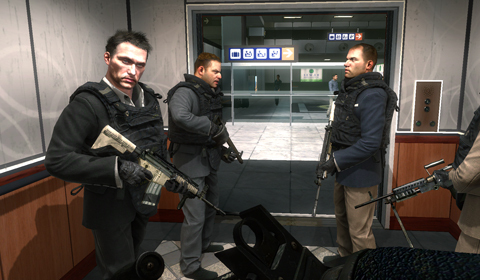 Makarov and his men walk out of the elevator while the player's weapon is lowered. The fact that the player can't use his weapon at this point would mean he can't turn on his comrades just yet. But while it's more than plausible that Allen has at least an inkling of what is about to go down, we'll keep the weapon lowered until the first group of civilians comes into view. As Makarov and his men open up, only then can the player choose to break his cover and take out his comrades. This ensures that there can be no doubt about Makarov's intentions, and seeing the first civilians fall will definitely solidify the player's decision, whatever it may be. Taste sweet justice, you godless commie! Now let's assume the player has decided to stop the attack by killing his comrades. This means Allen ends up standing over their corpses, a smoking gun in hand. What happens next unfortunately means taking control away from the player, a lazy technique but one that doesn't seem out of place within a game that regularly employs it. Allen tosses the weapon he is holding, raises his hands in the air and kneels down (much in the same way some civilians do during the attack). A few airport guards run up, weapons drawn, and approach Allen. They forcefully subdue and handcuff him, and at this point, the level ends (prematurely). 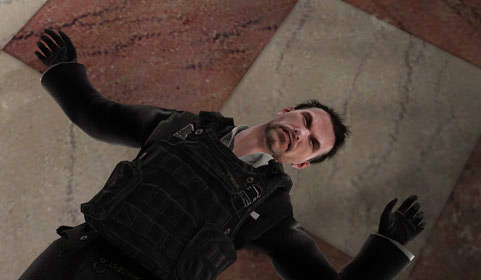 The net result is that Allen is alive but in custody, while Makarov is dead, his attack not carried out (or only in part, depending on when the player decided to stop it). The crux of this solution is the Ultranationalists' desire to invade the United States and their willingness to accept or manufacture any pretext to do so. And now that they have an American operative in custody who can be implicated in an attempted terrorist attack on Russian soil, they have everything they need. Allen's protests aren't heard and he is sequestered, cut off from the world's eyes or perhaps paraded around in the media as living proof. If his status as a CIA operative were revealed, the Ultranationalists could allege that the American government had knowledge of an impending terrorist attack on Russian soil but chose not to intervene. And if not, it's still an American posing as a Russian who had a role in the attack, however far it went. In either case, the Washington D.C. missions can go ahead unchanged. With Makarov dead, Task Force 141 can no longer draw him out, but needs proof of his involvement in the attempted attack. While Imran Zakhaev got himself a statue in the middle of Red Square, it would seem implausible if Makarov were equally canonized by the Ultranationalists. His status as a terrorist is plastered across all the early mission briefings, so his death could not be portrayed in the same way as was Zakhaev's: as that of a man who was martyred for his country. Instead, Makarov's role is covered up, every trace of his involvement carefully removed by Russian officials answering to the Ultranationalists. This means Task Force 141, who was aware of Makarov's plan, would need to counter any claims denying Makarov's presence by uncovering irrefutable proof to bring to a higher court. On that note, it's interesting that there is never a mention made of a formal declaration of war, which makes the Russian invasion of Washington D.C. an illegal act. Task Force 141 follows leads to Rojas in Rio De Janeiro and ultimately to Price, who is now not required to find Makarov, but to aid in the search for proof. It is implied that Price knew about Makarov before his rise after Zakhaev's death, so he can help Task Force 141 in finding evidence, if he himself can't be the evidence. After Price goes rogue and detonates a nuclear missile over Washington D.C., he lays out two of Makarov's former safehouses which might hold vital intelligence. These locations are raided, after which General Shepherd's betrayal takes center stage. Price learns of Shepherd's location another way (perhaps through interrogation of a Shadow Company soldier) and the endgame plays out the same way. It's apparent that the flow of missions doesn't need to be altered when following from the player's decision to stop the attack. All that needs editing are the briefings between missions and a few lines of in-game dialogue (mostly limited to changing a few verbs to the past tense when referencing Makarov). Every mission can play out the same way, only the context is sometimes different. For instance, when retrieving Makarov's personal files from his safehouse in the Caucasus Mountains, the troops that attack the player during the retrieval are now taking orders from someone within the Russian government in order to ensure that no damning evidence falls into the hands of Task Force 141. Overall, this solution comes off as inelegant and compromising, but since no missions are sacrificed, it's a good way of affording the player a choice to stop the killing of innocent civilians, albeit without that choice having any significant consequences. That unfortunately renders the choice meaningless, but the point is to adequately accomodate it regardless. It's a shame that choosing to stop the attack can't have any graver consequences than the ones currently in place, because those need to stay the same. By all means, kill Makarov. You\'d be doing me a solid. Incidentally, this lack of a different consequence can also be justified by another narrative strand: General Shepherd is working off his own agenda and wants the attack to happen in order to drive Russia and the United States into war. Moreover, Shepherd and Makarov were dealing with each other, so it’s likely that Shepherd said: “Alright, I’ll put a guy in your group you can pin the attack on. He doesn’t know the first thing about undercover ops, so just go along with his ineptitude and make him think you trust him”. This is also the reason why Allen was inducted into Makarov's group quite so fast. Deceived from the get-go, Allen was therefore doomed to fail, an aspect still upheld if he now survives by stopping the attack. I'm not saying that this is what Infinity Ward should have done. It's what I would do if this assignment was given to me. It involves the adding of content that may not even be experienced by some players, but a touchstone of good design is the quality of any content that the player will likely never see.